In March 1922, Gandhi was tried before Mr. Broomfield, I.C.S., District & Sessions Judge of Ahmedabad, for sedition in respect of two articles, which he had written in his paper "Young India". Before that, there was acute unrest and hostility to government, mainly due to the doctrines preached by Gandhi, and his campaign of non-cooperation and civil disobedience. This had resulted in some acts of violence and bloodshed. The most recent were attacks on peaceful citizens involving much bloodshed and destruction of property by an infuriated mob in Bombay on the occasion of the visit of the Prince of Wales in 1921. Another was the inhuman burning alive of a number of policemen by a maddened mob at Chauri Chaura near Agra. Of course, Gandhi deplored and denounced these acts of violence; and even suspended the campaign for some time, himself going on fast by way of penance. The situation was further embittered by the discontent of Mussalmans over the treatment of Turkey by the Allies after the termination of the War. The Indian Mussalmans looked upon the Sultan of Turkey as their Khaliph, and deeply resented any indignity shown to him by the European powers, including England. The Muslim masses in India were incited and inflamed by the Ali Brothers who had started the Khilafat agitation. Gandhi joined hands with the Ali Brothers in their opposition to British rule in India. According to Strangman, "The Ali Brothers were at one with Gandhi in one particular only; and that was that they desired a cessation of British rule." The Hindu-Muslim unity at this juncture was artificial and ephemeral based on no common grievance. Hindus had little to do with Muslim sentiment over the humiliation of Turkey; and the Muslim masses never wholeheartedly shared the Hindu nationalism; and ultimately by insisting on Partition betrayed the national cause so far as the unity of the country was concerned. Neither the Hindu nor the Muslim could forget past history; for history, although it may be perverted partially, cannot be altogether obliterated. "They did not share his fantastic dreams either as to the means by which that end should be attained, or the results which should ensue. The iniquity of the Turkish Treaty was one of their main planks-a matter in which the Hindu was not even remotely interested". "Naturally enough," observes Strangman in 'Indian Courts And Characters', "after a time the divergence of views as to the method of attack became apparent. To teach the militant Mohammedan to adopt the principles of non-violent non-cooperation, is to teach the lion to display the playful tricks of the lamb. The Brothers gave utterances to incitements to violence for which, at Gandhi's instance, they published an apology, as a result of which the Government refrained from prosecuting them; but it was only for a short duration. The Brothers had subsequently to be prosecuted and convicted." On 29th September 1922, Gandhi published under his own name an article in his paper "Young India". Among the most serious features of the seditious incitements of the Ali Brothers was their attempt to tamper with the loyalty of the Indian troops. Gandhi wrote in his article that "he was not prepared for the revelation of such hopeless ignorance on the part of the Governor of Bombay. It is evident that he has not followed the course of Indian history during the past twelve months. He evidently does not know that the National Congress began to tamper with the loyalty of the sepoy in September last year; that the Central Khilafat Committee began it earlier, and that he himself began it earlier still." "I have no hesitation in saying," Gandhi proceeded, "that it is sinful for anyone, either soldiers or civilian, to serve this Government which has proved treacherous to the Mussalmans of India, and which has been guilty of the inhumanities of the Panjab. I have said this from many a platform in the presence of sepoys". "I shall not hesitate (when the time is ripe), at the peril of being shot, to ask the Indian sepoy individually to leave his service and become a weaver. For, has not the sepoy been used to hold India under subjection, has he not been used to murder innocent people at Jalianwala Bagh, has he not been used to drive away innocent men, women, and children during that dreadful night at Chandpur, has he not been used to subjugate the proud Arab of Mesopotamia, has he not been utilised to crush the Egyptian? How can any Indian having a spark of humanity in him, and any Mussalman having any pride in his religion, feel otherwise than as the Ali Brothers have done? The sepoy has been used more often as a hired assassin than as a soldier defending the liberty or the honour of the weak and the helpless." Gandhi wrote and published another article in his paper in which he answered Lord Reading, the Viceroy, who had, in a public speech, said that he felt perplexed and puzzled by the activities of a section of the Indian community. Lord Reading had stated: "I ask myself what purpose is served by flagrant breaches of the law for the purpose of challenging the Government and in order to compel arrest?" Gandhi's answer was: "We seek arrest because the so-called freedom is slavery. We are challenging the might of this Government because we consider its activity to be wholly evil. We want to overthrow the Government. We want to compel its submission to the people's will. We desire to show that the Government exists to serve the people, not the people the Government. "In a third article, he wrote: "No empire intoxicated with the red wine of power and plunder of weaker races has yet lived long in this world, and this 'British Empire " which is based upon organised exploitation of physically weaker races of the earth, and upon a continuous exhibition of brute force, cannot live, if there is a just God ruling the universe." It must be admitted that in comparison with this stark and strident sedition, the veiled sedition preached by Tilak for which he was prosecuted in 1908, pales into insignificance. This was an open and avowed challenge to Government and an attempt to inflame the masses of the Indian people including the sepoys, to throw off their allegiance, and destroy the government. It was impossible for any government to ignore this sort of sedition, proceeding from a man of such power and influence as Gandhi had by that time acquired over the masses of India. Gandhi was prosecuted and committed for trial before the Sessions Judge of Ahmedabad where the paper was published. Strangman as Advocate-General of Bombay proceeded to Ahmedabad to prosecute. Gandhi defended himself. Obviously there was no defence. There was little to do for Strangman and the court; for, Gandhi admitted all the charges and more than the charges. He and his co-accused Shankarlal Banker, the printer of "Young India ", both pleaded guilty. The Advocate-General suggested that, in view of the seriousness of the charges and the desirability that they should be fully investigated, the court should proceed with the trial. The judge, however, decided to accept the plea of guilty; adding, that he would hear counsel on the question of sentences. Strangman stressed the fact that the articles were not isolated instances, but formed part of a regular campaign to spread disaffection, openly and systematically, to render Government impossible and so to overthrow it. Further, that the author was a man of high intellectual power and a recognized leader; that "Young India" was a paper enjoying a wide circulation. Lastly, that a campaign of this nature must, if unchecked, necessarily lead to happenings such as had taken place in Bombay and Chauri Chaura rioting, murder and destruction of property, involving numerous persons in misery and misfortune. "Of what value is it ? he pleaded, "to insist upon non-violence, if at the same time, you preached disaffection to the Government, holding it up as sinful and treacherous, and openly and deliberately sought and instigated others to overthrow it. "Gandhi had prepared a lengthy written statement; but before reading it, he dealt orally with what the Advocate-General had said: "I would like to state that I entirely endorse the learned Advocate-General's remarks in connection with my humble self. I think that he was entirely fair to me in all the statements that he has made, because it is very true . . .that to preach disaffection towards the existing system of Government has become almost a passion with me. The Advocate-General is also entirely right when he said that my preaching of this disaffection did not commence with my connection with "Young India" but much earlier. . . . It commenced much earlier than the period stated by the Advocate-General. I wish to endorse all the blame that the Advocate-General has thrown on my shoulders in connection with the Bombay occurrences, Madras occurrences, and the Chauri Chaura occurrences. Thinking over these things deeply. . . I have come to the conclusion that it is impossible for me to dissociate myself from the diabolical crimes of Chauri Chaura or the mad outrages of Bombay. The Advocate-General is quite right when he says that as a man of responsibility, a man having received a fair share of education and experience of this world, I should know the consequences of my acts. I knew them. I knew that I was playing with fire. I ran the risk; and if I am set free, I would still do the same. I wanted to avoid violence. Non-violence is the first article of my faith. It is the last article of my faith. But I had to make my choice. I had either to submit to a system which I considered has done an irreparable harm to my country, or incur the risk of the mad fury of my people bursting forth when they understood the truth from my lips. I know that my people have sometimes gone mad. I am deeply sorry for it; and I am, therefore, here to submit not to a light penalty but to the highest penalty. The only course open to you, Mr. Judge, is, as I am just going to say in my statement, either to resign your post or inflict on me the severest penalty." The judge then proceeded to pronounce sentence. 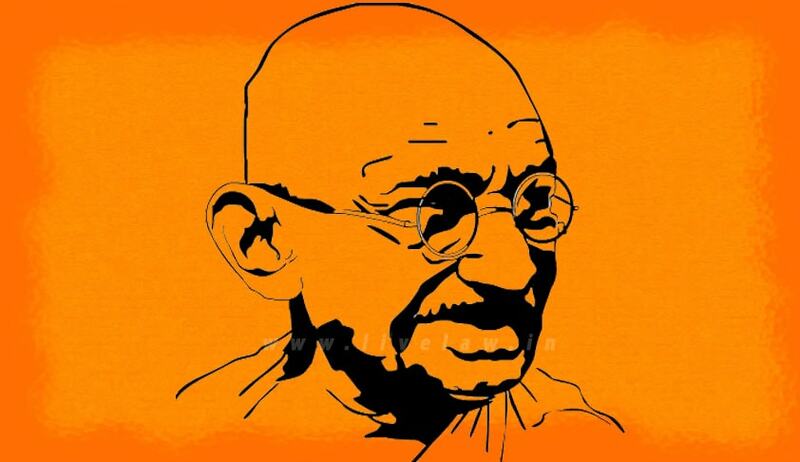 He said: "Mr. Gandhi, you have made my task easy in one way by pleading guilty to the charge. Nevertheless, what remains, namely the determination of a just sentence, is perhaps as difficult a proposition as a Judge in this country could have to face. The law is no respecter of persons. Nevertheless, it would be impossible to ignore the fact that you are in a different category from any person I have ever tried or am likely ever to try. It would be impossible to ignore the fact that in the eyes of millions of your countrymen you are a great patriot and a great leader; even all those who differ from you in politics look up to you as a man of high ideals and of noble and even saintly life. I have to deal with you in one character only. It is not my duty, and I do not presume to judge or criticise you in any other character. It is my duty to judge you as a man subject to the law, who has by his own admission broken the law, and committed what to an ordinary man must appear to be a grave offence against such law. I do not forget that you have consistently preached against violence, or that you have on many occasions, as I am willing to believe, done much to prevent violence. "But having regard to the nature of your political teaching and the nature of many of those to whom it was addressed, how you can have continued to believe that violence and anarchy would not be the inevitable consequence, it passes my capacity to understand. There are probably few people in India who do not sincerely regret that you should have made it impossible for any Government to leave you at liberty. But it is so, I am trying to balance what is due to you against what appears to me to be necessary in the interest of the public; and I propose, in passing sentence, to follow the precedent of the case, in many respects similar to this case, that was decided some twelve years ago, the case of Mr. Bal Gangadhar Tilak, under the same section. The sentence that was passed upon him as it finally stood, was a sentence of simple imprisonment for six years. You will not consider it unreasonable, I think, that you should be classed with Mr. Tilak; and that is the sentence two years' simple imprisonment on each count of the charge, six years in all, which I feel it my duty to pass upon you. "The Judge added, "if the course of events in India should make it possible for Government to reduce the period and release you, nobody would be better pleased than I". The Judge then rose. Gandhi bade goodbye to his friends. Many of them wept but he remained calm and smiling. Strangman adds: "So ended the trial. I confess that I myself was not wholly unaffected by the atmosphere." This trial is remarkable not only for the personality of the principal accused, but for the calm dignity and utter absence of any acrimony, conflict or denunciation on the part of either the accused, the judge or the prosecuting counsel. In spite of the intense excitement prevailing in the public, there were no untoward incidents marring the proceedings, no note of jubilation or indignation but only of subdued sadness on all sides. There was not much of a trial; but so far as it went, it was absolutely fair. The address of the Advocate-General, although he had to deal with a case of flagrant sedition, was marked by exemplary fairness and restraint. It is almost the only political trial in the history of Indian unrest which reflects credit on all parties concerned. It stands out in clear and wholesome contrast to the previous trial referred to by the judge. This kind of calmness, fairness, restraint and moderation, is all the more remarkable when we consider the nature of the sedition which provoked the prosecution, the personality of the accused, and the prevailing political atmosphere. From the standpoint of the Government, the situation was peculiarly difficult and dangerous. Not only the Hindus under the inspiration of the Mahatma, but the Mussalman masses incited by the Ali Brothers, were in a turmoil of excitement and agitation. Counsel for the Government would have been justified, in such an atmosphere and such a case, to indulge in strong denunciation of the sedition charged and admitted. The trial is memorable not so much for its political importance, as for the appositeness, and the felicity and fairness of the speeches of the three principal actors in the drama. Great credit is due to the two Englishmen who, in the face of what, from their standpoint, was a wanton, vehement, virulent and venomous denunciation of their Imperial history, and a gross perversion (as they believed) of the benevolent role of British rule in India, maintained a fair and calm attitude throughout. The address of the judge to Gandhi while passing sentence stands out in notable contrast to the ill advised and utterly uncalled for remarks of his predecessor in the Tilak trial in 1909. All the three speeches on the occasion of this trial of Gandhi, viz., of the Advocate-General, the judge, and of Gandhi himself, are models of moderation, mutual respect, and felicity of expression. The account of this trial is in substance taken from an admirable summary of it given by Sir Thomas Strangman in his book "Indian Courts and Characters". The above Article is published on Bombay High Court Website. The original link is here. In the website it is mentioned that it is taken from the book 'Famous Judges, Lawyers and Cases of Bombay : A Judicial History of Bombay during the British Period, By P.B. Vachha, Published by N.M. Tripathi Pvt. Ltd., Bombay in the year 1962. This book was published on the occasion of the Centenary of the Bombay High Court.